States typically offer different probate procedures depending on the size and contents of your estate. This helps prevent a large, expensive probate case for a relatively small estate, as small estates may not require much court interaction at all. For example, Texas’ small estate affidavit procedure applies to estates with $50,000 or less in assets, not including property classified as homestead property or exempt property under Texas law. Texas small estates can be distributed by an affidavit, or sworn statement, rather than a more involved probate process. Oregon’s guidelines offer a similar procedure for estates with personal property valued at $75,000 or less and real estate valued at $200,000 or less. You can check your state’s guidelines to determine what type of probate procedures your family may have to follow upon your death. After your death, an “interested person” must initiate your estate’s probate case. An interested person is simply someone who may be affected by the case. Commonly this will be someone who stands to inherit from your estate or the person you name as executor in your will. This person must file a form with the probate court that serves the area where you lived at the time of your death. Forms vary between courts, and the court may require a copy of your death certificate along with the original copy of your will, if you have one. The court begins the probate process by appointing someone to act on behalf of your estate, called an executor, administrator or personal representative. The court also determines whether your will should be accepted as valid under state law. Your personal representative must also inventory the assets in your estate, including anything you owned at the time of your death that does not pass under a non-probate method like a trust or insurance policy. 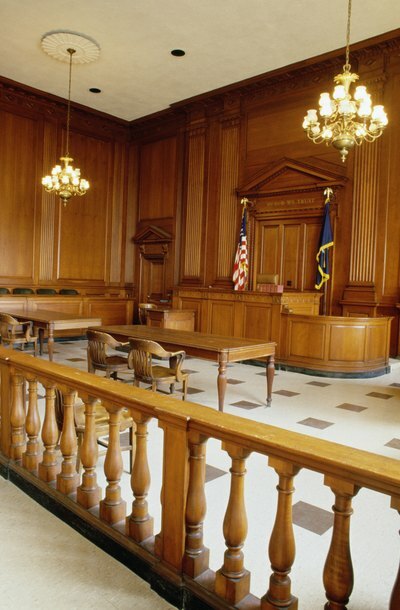 Most court guidelines require personal representatives to file a written inventory with the court at least once at the beginning of the case, and a final inventory may also be required at the end of the process. Your debts must be paid off before your beneficiaries can receive any remaining assets, so your estate's personal representative must notify your creditors that your estate is in probate. Under your state’s rules, this could mean sending direct notice to your known creditors, publishing a notice in the newspaper or posting a notice at the courthouse informing possible creditors that your estate is open to accept claims. Your personal representative must evaluate the claims he receives to determine whether they are valid and payable under your state’s rules. After he pays your debts, your personal representative can distribute your estate’s remaining assets, but he must follow your state’s guidelines. If your will has been accepted as valid, he must follow the distribution structure you created in that will. If you did not leave a valid will, you are said to have died intestate and your representative must follow the intestate succession guidelines for your state. Typically, state guidelines give half or more of your remaining assets to your surviving spouse with the other half going to your children. However, this varies widely between states and also varies depending on whether you had children from another relationship. Your spouse’s estate must generally go through your state’s probate process regardless of whether your spouse had a will. However, some assets, such as life insurance, can be distributed without going through probate at all. Additionally, most states have a simplified or abbreviated version of probate for estates that qualify. A will is a document that tells a probate court how to distribute the assets of the person who wrote the will -- known as the testator -- after he dies. A will must be prepared in accordance with state law or it will not be enforced. The laws of the various states differ somewhat on what is required to create a valid will. If your will is declared invalid, your property will be distributed among your relatives in accordance with the state intestacy law. How Does the Beneficiary Collect When the Loved One Passes?